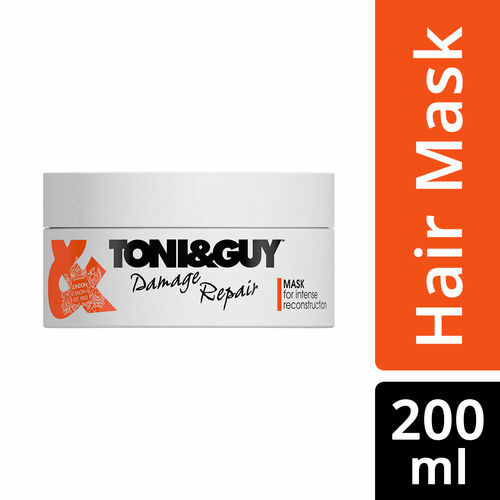 The Toni&Guy Reconstruction Mask provides intense conditioned nourishment to enhance softness and shine. The deep conditioning formula conditions the hair fibre for advanced repair and conditioning. Giving the desired softness and nourishment to your hair. The smooth and thick texture covers every strand as you apply and gives attention to the hair ends for smoothness and shine. It has ingredients that gives deep conditioning to your tresses. Must use when your hair needs some serious attention. The Toni&Guy Reconstruction Mask offers intense nourishment and repair for weak, damaged and dry locks. This salon-inspired formula strengthens and fortifies, resulting in healthy-looking hair with less breakage. For the best results, use with Toni&Guy Cleanse Shampoo for Damaged Hair. Toni&Guy has years of experience styling celebrities and top models and creating cutting-edge hair fashion trends. Tested backstage at international fashion shows, Toni&Guy's collection of salon-quality hair care and styling products is the perfect way to help you update your look. Toni&Guy understands that when your hair and wardrobe work together, you can fully express your personal style.. This mask provides intense nourishment to enhance softness and shine. Explore the entire range of Hair Creams & Masks available on Nykaa. Shop more Toni&Guy products here.You can browse through the complete world of Toni&Guy Hair Creams & Masks .